Home Features New Thunder Bay Courthouse officially complete. New Thunder Bay Courthouse officially complete. Construction of the Thunder Bay Courthouse is complete, improving justice services for local residents. Madeleine Meilleur, Attorney General of Ontario, was joined by Cathy Rodger, councillor, Fort William First Nation on behalf of Georjann Morriseau, Chief, Fort William First Nation; Stan Beardy, Ontario Regional Chief; Michael Gravelle, Minister of Northern Development and Mines and MPP for Thunder Bay – Superior North; Bill Mauro, Minister of Municipal Affairs and Housing and MPP for Thunder Bay – Atikokan; Keith Hobbs, Mayor of Thunder Bay; and other local dignitaries, at a ribbon-cutting celebration to mark the completion of the project. 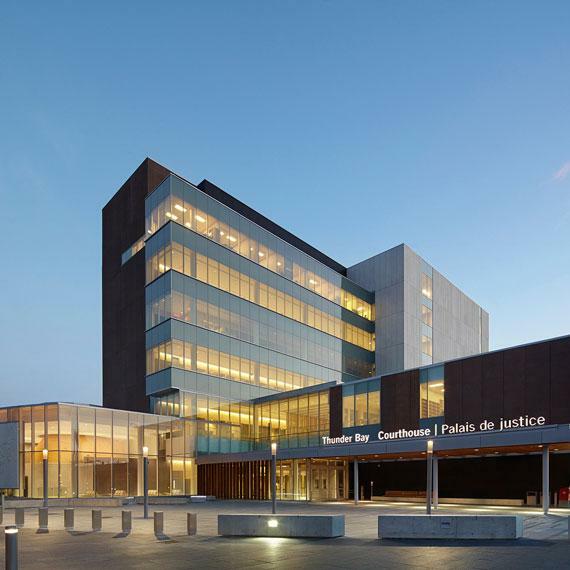 The new facility, located between Brodie and Archibald streets, south of Miles Street, in Thunder Bay’s downtown south core, consolidates the Superior Court of Justice and Ontario Court of Justice, previously operating in separate locations. The multi-storey building has space for 15 courtrooms, including a multi-accused, high security courtroom and four judicial conference rooms, including one Aboriginal Conference Settlement Suite. Construction of the new facility began in November 2010. At the peak of construction, there were an estimated 320 construction workers on site daily. The new courthouse was fully operational on April 14, 2014. The design and materials used throughout the new courthouse reflect Thunder Bay’s natural environment. Stone and wood are used at the building’s base for durability and to represent the natural elements of the Thunder Bay region. The textured glass tower on the building’s south face is designed to evoke the region’s many waterfalls. 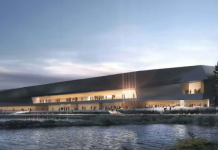 Infrastructure investments like the Thunder Bay Courthouse are part of the government’s economic plan that is creating jobs for today and tomorrow. 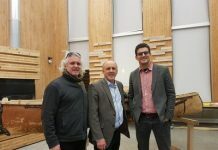 Infrastructure Ontario partnered with the Ministry of the Attorney General in the development of the new Thunder Bay Courthouse. 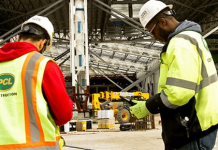 Infrastructure Ontario is a Crown agency of the Province of Ontario that delivers large, complex infrastructure renewal projects on time and on budget. Over the last six years, the province has applied Infrastructure Ontario’s Alternative Financing and Procurement model to 83 major projects valued at approximately $38 billion, saving taxpayers an estimated $3 billion.